First of all, I want to make a shout out to my boys D-Bo and Skinny back in the joint, and a shout out to Ray-Ray, Big Fred, and Ice Man from the hood. Tell Momma that they got the wrong guy and I’m going to try and bust out soon. 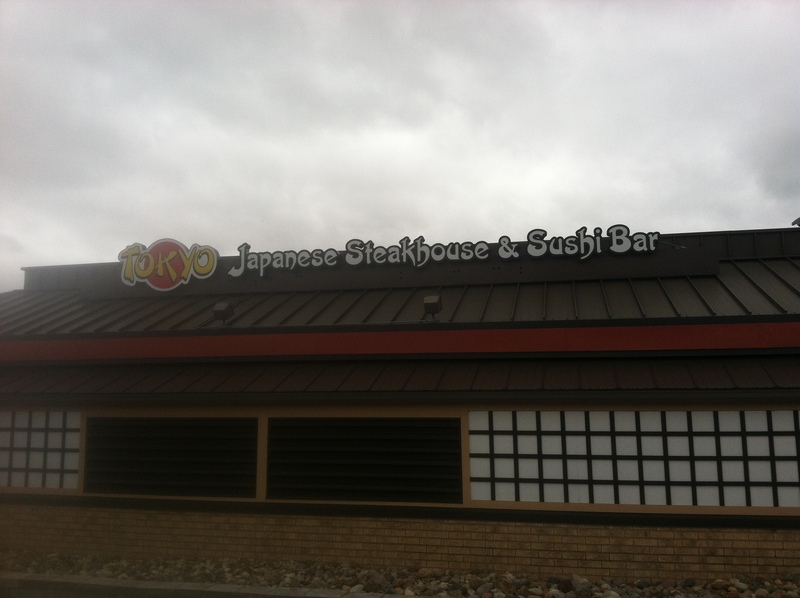 For my last meal I wanted some steak, fish, and good Asian food so the warden took me to Tokyo Japanese Steakhouse and Sushi Bar. 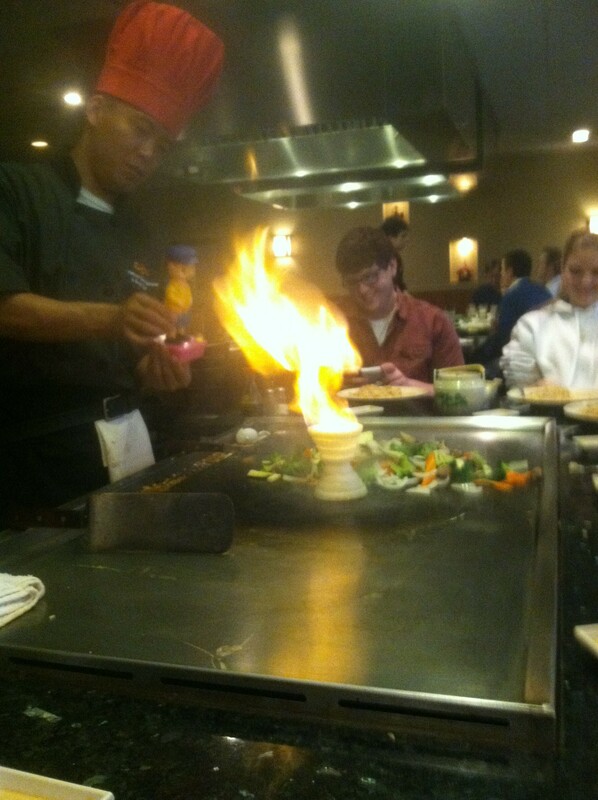 I heard some good reviews about it and noticed they cook the food right in front of you like they do at a Benihana. 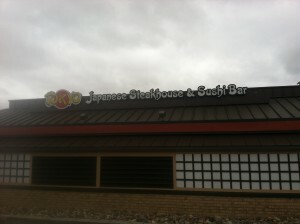 It was strange to me, though, that it was a Japanese steakhouse. I didn’t realize that they did a lot of cooking with steak. We got to the restaurant and it took a little bit to get seated, not that I minded considering I’ve spent half my life in an 8 by 10. The restaurant was decorated pretty nicely on the inside. There was a bar for both drinks and sushi and a large seating area. Each table had a big flatiron grill in the middle with seating for about 10 to 12 people. It wasn’t very busy and we had quite a few in the group so we all sat at the same table together. If there are smaller separate groups they generally seat them together at a table. The atmosphere was kind of soothing: it was fairly dimly lit and they played general music from the radio. The waiter, who was a bit aloof, brought us out a salad with a ginger dressing for starters. It was garnished with something that tasted like fried onions with a similar texture. The ginger dressing had an interesting tangy-ness to it. I ate it pretty quickly. It definitely beats the slop on a tray I’m used to. The menu was fairly small but unique. 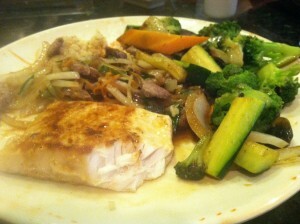 It had things like swordfish, squid, mahi-mahi, and different cuts of steak . I chose the mahi-mahi with a Sukiyaki sirloin steak. 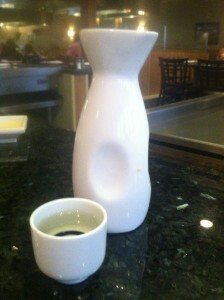 We also ordered some saki with our meal which they brought out to us from the bar. I’m not one for rice wine, especially when it’s hot, but it tasted pretty good. It burned a bit going down to the stomach, but I could handle it. The officer I was with said he was surprised and that he didn’t think I could feel anything at all. I was not amused. After a little while a cook came out with a cart full of meat, veggies, rice, and other things like bottles of sauces and water and cooking utensils. I thought it was a bit of a stereotype, as he was one of those funny Asian guys with an accent who did cool tricks while cooking, but it was still entertaining. He did things like launching rice into our mouths and set things on fire. I really like fire. Fire! The little peeing man puts it out. Watching the cook prepare our food seemed like the main course more so than the meal. That is until I started to eat it. The rice was very tasty. It tasted like good fried rice should, only with lots of butter and garlic for an extra flare. The steak was tender and had that great sirloin flavor. That, too, was cooked in butter and garlic. The mahi-mahi was cooked perfectly. It seemed to melt in my mouth. It didn’t taste like there was much seasoning on it; it just was a genuinely good piece of fish. The veggies, which had mostly zucchini, carrots, broccoli, and mushrooms, were pretty good, too, but seemed like they were still a little bland even with soy sauce. I dipped those in yum yum sauce which was great. The yum yum tasted mostly like thousand island dressing. I got full quickly and could not finish my meal, so they let me take it in a to-go box and snack on it during my execution. Steak, Mahi, veggies, and rice. If I could, I’d definitely go back again. They really know how to prepare steak and fish, all while entertaining. Though, I swear I didn’t kill that guy like they said I did, I’d consider killing again for some food like that.